TomTom has officially unveiled the latest celebrity to lend their voice to the manufacturer's sat navs - Darth Vader. Launched today, which by mighty coincidence is unofficially Star Wars day (May the fourth be with you, and all that) TomTom has revealed that the voice will be available from its store for £7.95. TechRadar got wind of the news last week, when we received an interesting email from no less than Darth Vader himself, with the following statement: "I find your lack of faith disturbing. Drive with me to the Dark Side…"
We used the Force and found that the MP3 file attached to the email (which was of the Star Wars theme tune) played in Media Player with the metadata saying 'TomTom albums'. TomTom asked us nicely not to spoil the surprise and, fearing the power of the Dark Side, we agreed. TomTom is no stranger to adding novelty voices to its sat navs. Just this month it was announced that Billy Connolly had lent his Scottish brogue and they have already snapped up the dulcet tones of Homer Simpson. Adding Darth Vader to TomTom is definitely something which brings out our inner geek. Although the voice doesn't come with a Hans-free kit, work with a Jabba Bluetooth headset, or tell you where all the Leia-bys are, you do get Darth Vader warning alert sounds, wallpaper and a nice Vader-shaped map icon. 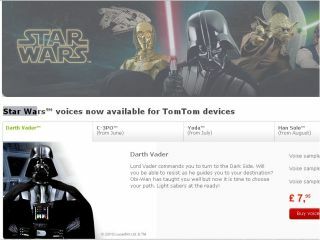 To get Darth Vader on your TomTom, go to http://starwars.tomtom.com/voices. If you rather wait for other Star Wars voices, then Han Solo, C3PO and Yoda voices have a UK release date of June, July and August respectively. Rumours that Chewbacca and R2D2 have defected to CoPilot are still unconfirmed.